Ministry of Propaganda - 20/Nov/2005: "Urgent Reminder"
Aaah, now we're getting somewhere: This doesn't apply to me! So why are you sending me an urgent reminder then? Only to tell me in the small print that this doesn't apply to me? Some people would call this a con, trying to trick people into paying something they don't have to. But then you wouldn't do that, would you? Failure to purchase a licence in the next few days will results in us taking further action. Oh, not again. I think I know what's coming now. Yes, here we go: Your address is now on our priority list and an Enforcement Officer is planning to visit you shortly. On the other hand this raises an interesting question: How long is 'now' and how do you define 'priority'? According to all the letters you've sent I've been on your 'priority list' for more than two years. And what has happened so far? 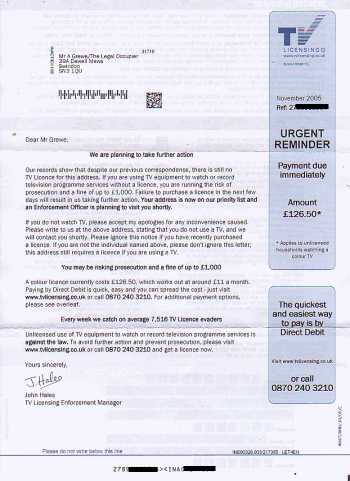 One of your TV Licensing Officers stuffed a letter into my letterbox but forgot to include the pre-paid envelope.